This workshop is now full – Please contact us if you wish to be on the waiting list. Natural clay plasters create a look and feel unmatched by conventional painted drywall. Earthen plasters have gained in popularity in recent years, especially since the introduction of premixed powdered forms available bagged and in a variety of colors. For those who prefer to create their own plasters from local clays, endless color and texture possibilities exist, and costs can be minimal. 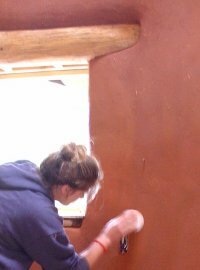 This workshop is designed to begin or add to your ability to create a beautiful interior finish coat of earthen plaster. You will learn how to mix and apply two specific plasters designed for the walls and ceilings of a new room that was converted from a garage. We will be plastering on the earthen base coats over cob and light clay straw walls, primed drywall walls, and a reed-matted ceiling. Additional color and texture options will be discussed as well. Tempe Sikora, our workshop instructor, specializes in specialty natural plaster and paint application as well as custom European faux finishing. She is also an accomplished photographer. Tempe works primarily in the Austin area as well as in northern California, and her beautiful work can be viewed on her website, www.rarestbloom.com . Fee for the workshop is $75 and includes a healthy vegetarian lunch and all necessary workshop materials and tools. Water, coffee and tea will also be provided. Enrollment is limited to ten people. Register for the workshop HEREor contact Gayle at gayle@designbuildlive.org or 512-478-9033.